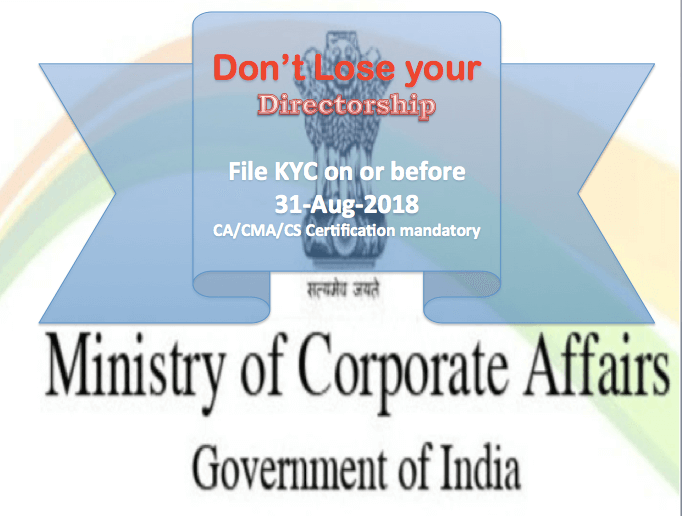 Ministry of Corporate Affairs (MCA) has recently notified that every Directors has to file his/her KYC e-Form DIR-3 KYC with The ROC on or before due date to update MCA Directors Register. NOW FROM 2018 ONWARDS, Directors’ KYC has to be submitted with ROC vide e-form DIR-3 KYC, every year along with documentary evidence of ID Proof and Proof of present address. KYC Submission to be opened on 10th July 2018 and shall continue till 31st August 2018. Accordingly, every Director who has been allotted DIN on or before 31st March, 2018 and whose DIN is in ‘Approved’ status, would be mandatorily required to file form DIR-3 KYC on or before 31st August,2018. 1) A Unique Personal Mobile Number. 3) DSC of Director duly Registered. 4) Self attested PAN card. 5) Self attested Aadhar card with updated Mobile number with UIDAI. 6) One Address proof - Self attested Electricity Bill, Mobile Bill or Bank statement of Director (latest by 2 Months). One Time Password (OTP) received at Directors Personal Mobile number shall duly verify DIR-3 KYC. Every Director using his own DSC should file the form. Practicing CA/CMA/CS shall certify the declared KYC and documents with his/her DSC. If KYC not submitted on or before due date of filing, Late filing fee Rs 5000/- shall apply and DIN will be deactivated citing as ‘Non-filing of DIR-3 KYC’. Till the DIN status Activated, none of the director shall be eligible to file any form with ROC with his DSC. DIR-3 KYC to filed separately for each Director. Any assistance feel free to consult with us.